It was last week when BSNL revised their postpaid plan to increase the data limit of their plans. And now it does so again by changing and revising their FTTH plan. To survive in the ever-competitive Telecom sector the state -owned telecom operator has revised and also introduced more plans for its Postpaid and Broadband services. 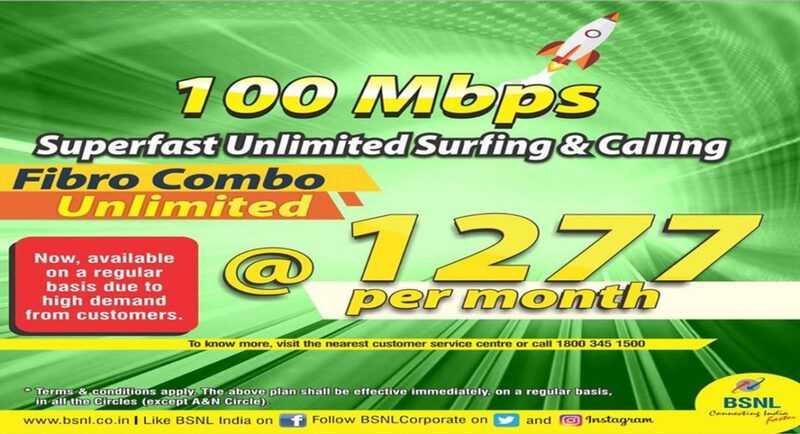 Recently, BSNL had added a new plan of Rs 2,499 for their broadband plan which offered 40GB data limit. And now it has revised its plan to offer daily data limit to its users. The FTTH plan of BSNL starts from Rs 777 and then goes up to Rs 16,999. The tariff plans include Rs 1,277, Rs 3,999, Rs 5,999 and Rs 9,999 broadband plans. And all the above-mentioned plans have been revised by BSNL to offer daily data benefits to its users. It is now offering 170GB of data everyday to its users with speeds up to 100Mbps. And the revised plans and benefits are effective immediately all across India. Similar to last year, BSNL introduced new data plans for all the non-FTTH users too, to became eligible for the data benefits it offers. And this time too it’s not only the new users who will get the revised plan benefits or people who will BSNL broadband recharge now. But people with existing plans will get the benefit of the new feature. The revised plans have all been renamed by BSNL, Rs 777 was earlier called ‘Fibro Combo ULD 777 plan’ and now after the revision it is called the ‘18GB plan’. The changed name is because it now offers 18GB of daily data benefits with the said plans comes with speed up to 50MBPS speed. This will be capped to 2MBPS after the FUP limit has been reached. Similarly, the ‘Fibro Combo ULD 1277’ will be called the ‘25GB plan’ because of its 25GB daily data benefit offerings. It will offer 100Mbps speed, which will drop to 2Mbps after reaching the FUP limit. In that order, the ‘Fibro Combo ULD 3999’ is now renamed to ‘50GB plan’ as it offers 50GB of daily data benefit with speed of 100MBPS. This will drop to 4Mbps after reaching the FUP limit. The Rs 5,999 FTTH plan is renamed to ‘80GB plan’ as it offers 80GB of daily data benefit with speed of 100Mbps. The speed will drop to 6MBPS after the FUP limit is reached. Similarly, Rs 9,999 plan is now called the ‘120GB plan’ as it will offer 120GB of daily data benefit with speed of 100Mbps. It will be capped to 8Mbps after reaching the FUP limit. And lastly, Rs 16,999 plan is now renamed to ‘170GB plan’, which will offer daily data benefit of 170GB with 100Mbps speed. This is capped at 8Mbps after reaching the FUP limit. Alongside the data benefits with all the above-mentioned plans, BSNL will also be giving unlimited voice calls but it will be limited to certain serviceable areas. With these revised plans and the daily data benefits BSNL is set to make its foothold strong in the Telecom sector.